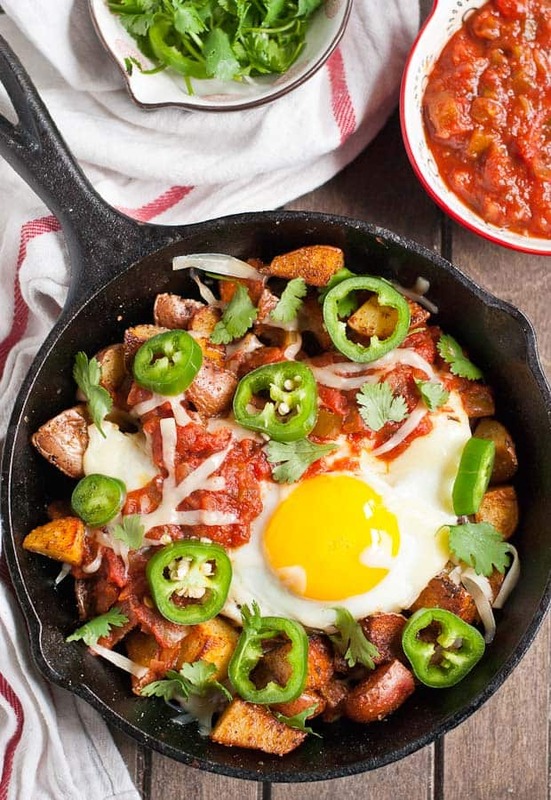 These easy Potato Huevos Rancheros start with perfect crispy pan fried potatoes topped with runny eggs, salsa, cheese, and sour cream. It’s a breakfast you’ll be thrilled to wake up for. I’ve been trying to master it for four years: the elusive crispy pan fried potato. You know the ones I’m talking about. The best ones are found at hole-in-the-wall diners, often under the name home fries. Their skins are seasoned and browned until crackly, with fluffy interiors that soak up runny egg yolk and rivers of maple syrup equally well. They are perfection. Pure breakfast perfection. Until recently, I thought if I wanted the recipe I’d have to sneak into my local greasy spoon and hold the cook hostage until he revealed his secret. Thankfully, I did some research and discovered the secret to perfect pan fried potatoes before jail time had to be involved. Here’s the deal. First, start with the right potato. Idaho® red potatoes are the perfect choice for crispy pan fried potatoes, because they keep their firm, creamy texture throughout the cooking process. Softer potatoes are great for mashing, but for this dish, we’re after a hearty potato that will still have some oomph when you bite into it. To save time, I put the unpeeled potatoes in the microwave for about five minutes so they’re partially cooked before going into the pan. After that, I drag out my trusty cast iron skillet, put a generous dollop of butter in the bottom and let it heat up until bubbly. I cut the potatoes into bite sized pieces, season them with salt, pepper, garlic powder, and smoked paprika, then place them right in the butter. Here’s where you have to resist every instinct that tells you to keep stirring the potatoes. You’ve gotta let those babies sit! After several minutes, they’ll have that golden, crisp exterior that makes them so irresistible. Then, and only then, you can flip them over and repeat the process on the other sides. Your restraint will be rewarded with perfect crispy, tender home fries that are worthy of the greasiest greasy spoon. I could probably make a meal out of these potatoes alone, but they’re even better paired with runny eggs, warmed salsa, melty cheese, cilantro, and sour cream. 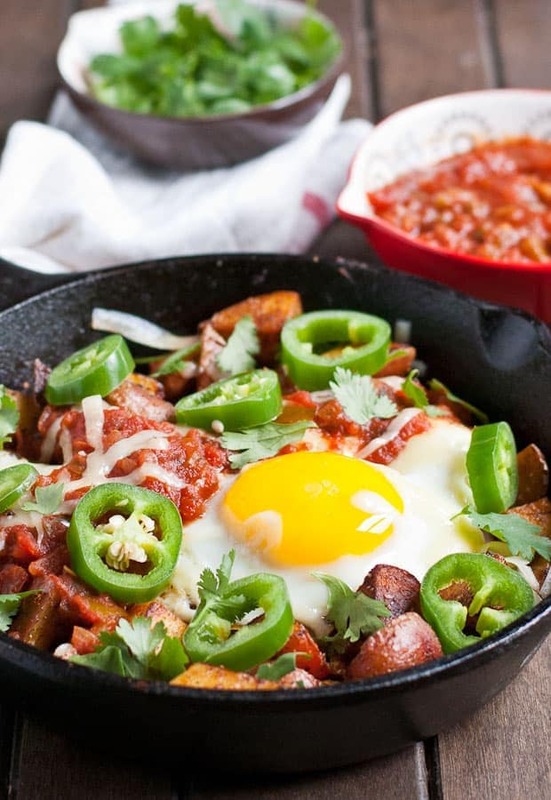 It’s a super fast version of huevos rancheros that allows you to have a killer breakfast or brinner on the table in under 40 minutes. Just make sure to keep those roving fingers from sneaking off with all the potatoes before the eggs are finished. Not that I have any experience with that problem. Place the potatoes in a microwave safe container and microwave for 4-6 minutes, turning halfway through, until they're just slightly softened. Slice the potatoes into bite sized pieces.Careful, they might be hot! Heat a large cast iron skillet over medium heat. Melt the butter in the skillet then place the potatoes cut side down in a single layer on top of the butter. (Note: Depending on the size of your skillet, you may need to do this in two batches. The potatoes won't get crispy if they're piled on top of each other.) Cook the potatoes undisturbed for about 4 minutes then flip, exposing the other cut side to the butter. Season with half of the seasonings and cook another 3-4 minutes or until both sides are evenly browned. Finally, flip the potatoes so the skin side is down. Season with remaining seasonings and cook another 3-4 minutes or until potatoes are crisped and cooked through. Remove from heat. Meanwhile, heat the salsa in a small sauce pan over low heat. Keep warm. Fry the eggs in a bit of olive oil or butter over medium heat to desired doneness. I prefer over easy eggs for huevos rancheros. To assemble, divide the potatoes evenly among the plates. 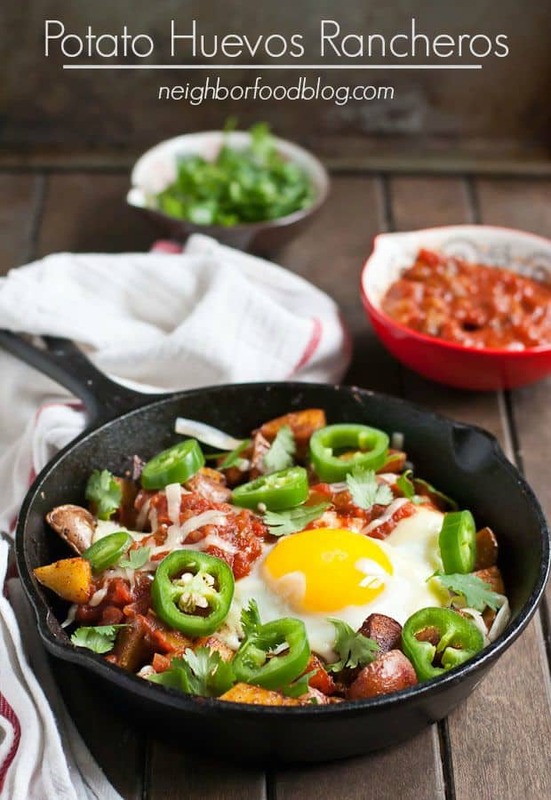 Top each one with a fried egg, large scoop of salsa, sliced jalapenos, cilantro, and dollop of sour cream. Eat immediately. This post is sponsored by Idaho® Potato. As always, all opinions are my own. Thanks for supporting the brands I use and love! You don’t understand how badly I want these potatoes! The egg is gorgeous and totally calling my name. 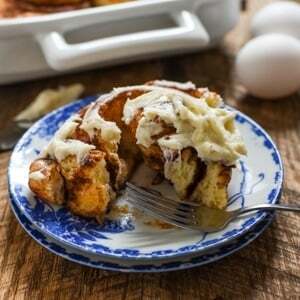 Perfect breakfast for dinner food. Thanks Carla! We definitely ate if for brinner! Yay for perfectly crispy potatoes! And even more yay for crispy potatoes with drippy eggs! This looks perfect. Thanks Karly! I can’t resist potatoes and a good runny egg! That looks so good that I’m wondering if I have the ingredients on hand to make it for lunch! I hope you do! It’s such a great lunch! This is my kind of breakfast, lunch or dinner! I love your idea of microwaving the potatoes first, what a great tip! It’s great for any meal of the day! And I’m always for saving a little bit of time in the kitchen. 🙂 Thanks Lori! Yea! This is the perfect way to enjoy potatoes! Pure perfection! 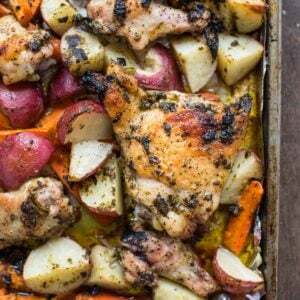 I could eat this for every meal and those potatoes are definitely perfect! No need to yell at you, because you’ve achieved crispy perfection! Huevos Rancheros are one of my favorite breakfasts-for-dinner on busy nights, and you’ve just given them a major upgrade with the potatoes! Love this recipe. Nothing beats a perfectly crisp plate of hash browns. Except maybe ones loaded up like these. YUM. Agreed! Crispy potatoes are the best! I want this for breakfast every. single. day. I really need to make this happen ASAP! Hope you love it Jennie! No need to precook the potatoes — I dice mine into about 1/4 to 1/3 inch cubes. They cook quickly. When browned a bit, cover to steam. Done when you can poke easily with a fork. I use a mixture of olive oil and butter.